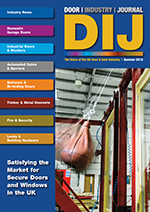 The Door Industry Journal: Did you miss the Launch of our Summer 2018 Issue? With the UK sizzling in the midst of a heatwave, what better time to sit down in the shade and read the latest issue of the DIJ. You are probably either looking forward to your holidays or already counting the days until the children go back to school! Either way, there’s plenty of reading inside to help you sit back and relax. If you design or manufacture doors, doorsets or windows for sale in the UK, it is essential that they meet minimum regulated requirements. In a fiercely competitive market, they must also be tested for certain beneficial performance characteristics to verify your marketing claims. To find out more about testing and third-party certification with Exova, go to page 6 to read more. We are frequently asked by our readers and contributors, what effect Brexit will have on standards and legislation. Michael Skelding, General Manager and Secretary of the Door & Hardware Federation, attempts to clarify some of the issues on page 8. The Master Locksmiths Association (MLA) are delighted to announce that DOM UK are to sponsor MLA Expo 2019, which will take place at Telford International Centre between 4th to 6th of October 2019. Turn to page 12 for more information on how to book your stand! And on page 60, there’s an article about the new Garamatic Canopy Operator which has been designed specifically to automate Garador’s extensive range of canopy up and over garage doors. So, make the most of the sunshine while it lasts and pack us in your suitcase with your sunglasses. My personal thanks, as ever, goes to all our readers, advertisers and contributors for your support in producing this issue. 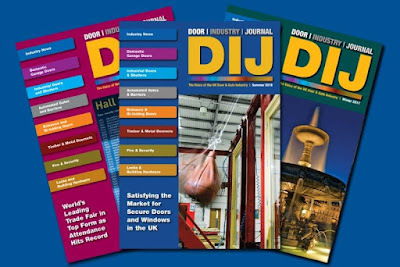 And on behalf of "Team DIJ", we all look forward to continuing to keep our readers engaged and assisting companies of all sizes with their publicity requirements in our next issue. You can now grab your sun cream, hat and shades and head off somewhere even nicer than the UK!